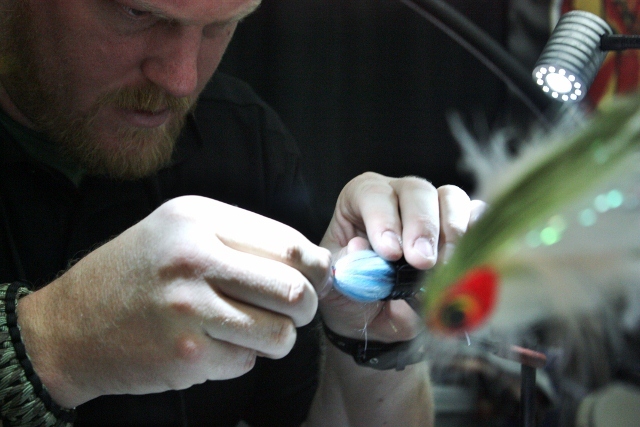 I first became aware of Mike Schmidt of Anglers Choice Flies (www.anglerschoiceflies.com) a couple of years ago, through the shadow world of social media. Since then I've become a huge fan of his tying. I have this streamer addiction that must be fed, and Mike's streamers are the stuff of legend. When I think of Mike, it's easier for me to picture him donning a Viking helmet and pillaging English villages than tying flies - he's a tall guy with red hair and beard that just says "let's burn this place". But once you get to know him, he's the nicest guy on earth. It's like talking to an old college chum, and he is particularly good at making people feel welcome at his table at the Expo. Some tyers are reticent and reclusive, Mike is gregarious and friendly. I asked Mike the hard questions about being a tyer. You be the judge. I should add that the first four questions I asked were deliberately lame questions I asked him as a joke and he still gave great answers. Enter to win a half dozen of his streamers and a fly box by filling out the form at the bottom of this post. FR: Mike- so what’s your favorite fly? MS: That is a broad question- I think my favorite fly this last year has probably been a Red Rocket, just because it has such great movement. It’s a nice pattern that kind of covers a lot of different species. That and a new one called a Slap Pig, it’s a big …. Mike: Yeah it’s the one that’s swimming in the back of the tank, so you can read about it… (laughs) It’s very similar to the back end of a Conrad Sculpin and the front end is very similar to a Deceiver style fly, and you have a bit of an epoxy head over the front, so it gets really cool movement, it’s easy to cast, it sheds water right away, and it’s very durable. FR: What’s your favorite river? MS: Uh, my favorite river is still the Au Sable. I love the Au Sable. If I had to narrow it down, to one area I’d probably- if you twist my arm I’d say the South Branch because there’s nothing on it. I love the Au Sable, but if I was going to go up north, then I might go up to the Fox, fish the Fox. FR: Yeah, I love that river. What’s your favorite color? FR: Marry, boff, kill… (Mike laughs loudly) Not really Mike- those were all my joke questions- I owe you better questions than that. So what are the keys to a really great streamer pattern? MS: Movement- absolutely movement. Eyes are very important as far as I’m concerned, especially for a trout fly because I believe that they are an apex predator that is going to key in on that eye, but the number one thing across the board is going to be movement. When I design a fly I’m designing it with different materials that have different properties in the water so that we have a fly in either a faster short strip, or a dead drift and still have movement on its own without me doing anything to it. FR: Streamer patterns range from being realistic to pretty outrageous- why do the more outrageous patterns work? MS: People have confidence in them you know? (laughs). FR: So it’s a confidence thing? MS: It’s all confidence. You see some of that crazy stuff, and it’s out to catch people, not to catch fish. But I think it gets back to movement, some trigger. If you strip the fly back to you real fast so that the back of it kind of folds up on itself like an injured bait fish, let it flutter for a second like an injured fish- that is a heavy trigger. You’re looking for those triggers, whether it’s eyes, or a certain movement, or sounds in some cases. Those are all very important pieces. FR: I tie for myself and I get bored with it sometimes. How do you keep tying on a commercial basis? MS: I try not to think about it. FR: Do you get a few Wings games in there? MS: Yeah. I have to force myself into just focusing on one thing and I just don’t think about it. That’s why , while I’m tying I have to have on the TV and a DVD on my computer of music so that my mind is pulled in a bunch of different directions and I’m just zoned out, tying away. I get into a groove. I also have a very addictive personality, and I keep doing it. It keeps me out of trouble and it keeps me busy. FR: It keeps you engaged in fly fishing as well? “Why did you spin your thread there?” or “Why did you put your finger there?” or “Why did you twist your wrist just a little bit differently there?” -- a lot of that I do without even thinking about it. So I still… the more you do it the more you learn if you’re paying attention. It drives me to continue, it doesn’t matter how many times I’ve tied a pattern. I’ve tied a hundred thousand Meal Tickets, and I still learn tricks every time I tie a big batch of them; I still figure something else out to make it easier as a tie. FR: I really like your winged wets- why do you still tie those? MS: Why do I still tie them? FR: That’s why I got into blogging. MS: There you go, something to keep you involved. Once I started tying commercially, I wasn’t tying so many of the pretty flies, though a lot of them are gorgeous, and others are just utilitarian. I try to tie something artistic at the end of each night, so I started tying one winged wet fly at the end of each night, so that I just have something artistic as an outlet, and something else to push a skill I wouldn’t get anywhere else. Thread control is probably most important with winged wet flies. You get that thread control down you can use that across everything else. It made me a better tyer across the board. I don’t fish them that often to be perfectly honest. I do still fish them in the spring. There’s a couple of patterns I think fish very well in the spring when the bugs are starting to get a little more active and move around. I’ll tie them down to size tens and twelves, and dead drift or swing them just like soft hackles. Most of the winged wets now wouldn’t be as effective the way they’re tied now versus the way they used to be tied. The way they’re tied now everyone tries to imitate, and I do the same thing, to sell them, and for display purposes, I tie them with a very clean throat underneath, when in fact the original versions were almost certainly tied in palmer, with the hackle circling all the way around. Almost as if you were tying a soft hackle over the top of a wing. The ones that I fish are very natural colors. Olives, tans, blacks, and I do palmer; instead of doing a throat I do a full collar for fishing. They fish really well that way. I do fish them, a little bit, but I still tie them because, it teaches you thread control, you’re using a very fine thread, having to compress everything into a short amount of space to do it right. FR: What do you say to a heathen like me who ties everything with Gel Spun Poly? MS: I hate Gel Spun Poly. MS: Ugghhh… I can’t do it. I use UTC 140 for just about every streamer I tie. 210 is acceptable, there’s certainly nothing wrong with it. I love to have that stretch. I use that stretch to my advantage. If you’re tying under maximum pressure and you happen to break your thread, if you’re using UTC, the thread will constrict on itself on the hook and most of the time it won’t come completely undone. You don’t lose that whole fly. That stretch also gives you a little bit of extra leeway. You can tie under maximum pressure with it, and it is still going to get even tighter because it’s always trying to return back to its resting state. I think it makes a better constructed fly overall. The biggest problem I have with the gel spun is not the breaking strength of it, I think that’s fantastic, that you can really ream down. I wish they could make a gel spun that stretched. To me I think that stretch is really important in the thread that constructs a lot of these streamers. 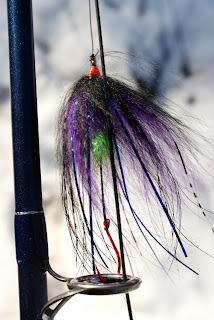 FR: It’s steelhead season- what streamer patterns should I be fishing? MS: Feenstra stuff. 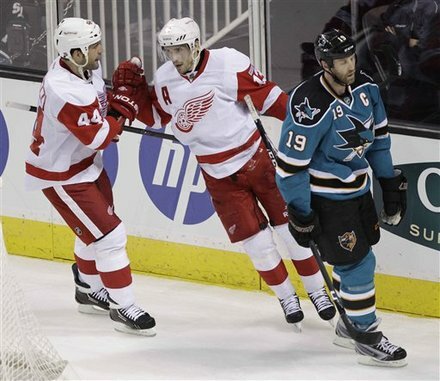 (Mike laughs loudly as Kevin Feenstra walks by). For my personal steelhead fishing, for steelhead stuff to swing I’ve actually gone old school. I like fishing a lot of traditional Scandis and (unclear) speys, so I’m using a lot of double-wings, you know, a back wing and a front wing, with some Schlappen to hold it up, or arctic fox or Finn raccoon either as a wing or encircling the whole hook as a spey fly. I think they have fantastic action in the water, and it goes back to “why do you tie winged wets”, I think that it’s the same reason I started tying Scandis, because it’s an old school fly, but they’re gorgeous, it’s such a pretty fly when constructed right. Once I was tying them I realized they fish pretty good, and once I confirmed that they fish good, I haven’t gone back to fishing the other stuff now. I really like the way they fish. FR: So are we going to fish this year? MS: Yeah, whenever I can. I’m going to be in Florida the second half of May, I’ll be in Wyoming in July. FR: Will you be fishing both of those locations? At this point some people walked up to his booth and it seemed like a good place to end it. I want to thank Mike for letting us into the deranged mind of a tyer. Back to the bench with you! Now it's your turn- Mike has put up a half dozen of his streamers and I'm putting up a large Morell fly box to put them in. Enter to win them by filling out the form below. Contest entry closes on Wednesday March 28 at midnight. Really enjoyed this one as well. I love GSP, but I can see why you'd want something with some stretch, Mike. I mainly use it for dear hair work, and when I'm spinning up a CDC brush for some of the dries I tie. Great interview. Wish we had some browns down here in Texas for me to throw more of your streamers at, but I'm hung into some big 'bows and a few nice bass with them already! Matt- come on up when the heat is killing you down there- we'll get some browns. I have bass and bows as well. Glad you enjoyed it. I've yet to connect with the 'inner fly tyer' in myself. I like to blame it on my ADD, but after reading this I see my go-to excuse for skipping the fly tying part of my fly fishing is rather weak. Thanks Rebecca. Glad you entered. Um, let me guess- Alma Mater? Nice interview. Mike seems like a happy guy that you'd love to fish with. I'm hoping I do fish with him this year. Can you believe I blew it twice last summer? I won't let that happen again. "let's burn this place"!! Many of Mike's flies have caught my share of large trout and steelhead- especially the Grease Stain. we also share a certain affinity for packing Nutty Bars on long road trips. Ah, Nutty Bars- memories. I picked up a few of his flies for my own personal use- I'll be using them shortly. Had a blast hanging out and doing the interview man, glad people are enjoying it. We will definitely make it happen on some fish this year! "he's a tall guy with red hair and beard that just says "let's burn this place." I love that metaphor. Keep up the good work. Thanks Brent. I'll do my best. I'm having a lot of fun with these interviews. While I have yet to pony up the cash, I have long admired Mike's big streamers from a far. Great interview, Mike and Jason. I have to agree that streamer fishing can be all about confidence. But, a little movement and some excellent color combinations can certainly do the trick, as well. Ivan- you are probably THE person I would want to streamer fish with. Do you even know what a dry fly is? Mike is of course my other choice. I have a streamer trip lined up with a guide in two weeks, so I'm hoping for a good day. Funny you mention dry flies. So, skwala stoneflies are hatching on the Bitterroot right now. Often seen as one of those hatches that brings big fish up to the surface, all I can think about are all the big and bigger fish that are sitting below waiting for larger meals of protein to come their way. Since I started mousing it's hard to get too excited about the Hex hatch. I know what you mean.